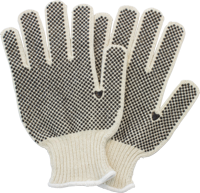 Dotted gloves combine our high quality blended knit gloves with a PVC coating in dotted or criss-cross patterns that provide a better grip for material handling tasks. Our jersey, canvas, nylon, and cotton/polyester string knit gloves are all available with these added grip features. Rule 110.10 Dotted gloves sold by The Safety Zone meet the requirements for handling of human food in both the manufacturing and packaging phases of production. Rule 177.1950 Dotted gloves sold by The Safety Zone contain chloride-ethylene co-polymers, which may be safely used for repeated use when coming into contact with food.